I love how aromatic and tasty cilantro is; I really think it´s a wonderful herb. I don’t know if this is an acquired taste, as the bold ingredient is present in many Peruvian dishes (it even is the star in some of them), or I’m just lucky to have been born in Peru. The recipe that I am sharing today has cilantro as the principal source of flavor, and it is one of my favorites. 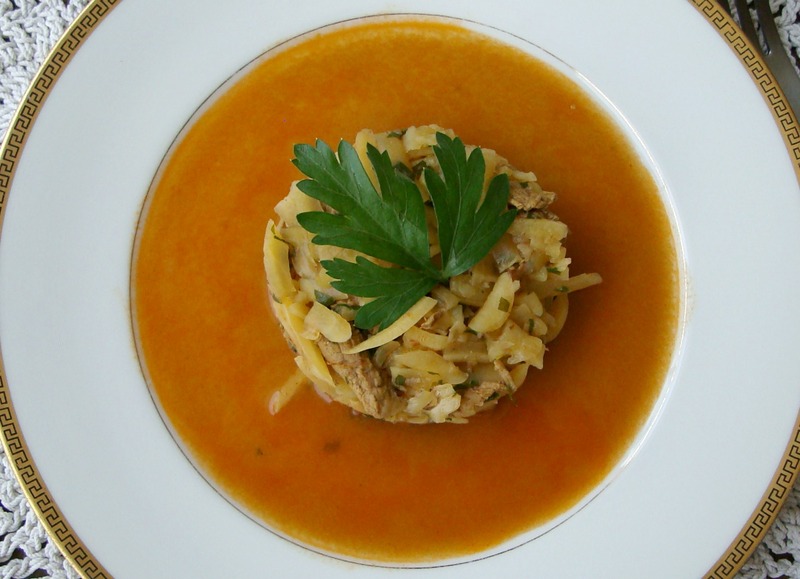 Seco is one of the most popular recipes of Peruvian cuisine, and one of the main elements of traditional “comida criolla”, which is the name we give to typical food from the coastal region of the country. The roots of this dish in our gastronomy are very old, a product of the Arab influence that the Spanish brought with them during colonial times. Seco was originally prepared in the northern part of the country, but it is now eaten all along the coast. When you try it, you will understand why it has become so popular. As would be expected, thanks to the cilantro this entrée’s flavor is intense and delicious. We usually have it with white fluffy rice and canary beans on the side, and a drizzle of olive oil on top. Although it is traditionally made with beef, chicken or goat, the recipe allows for some variations and could be made with other kinds of meat, fish, seafood, or even just vegetables. The secret here is to let the meat simmer over medium-low heat, so it can absorb the flavors and get a fork tender texture. The result, for me, is irresistible. Put the cilantro and spinach in the blender and process with one cup water. Reserve. Heat the oil in a saucepan over high heat and when it is very hot sear the beef pieces until they are golden brown. Add the onions, garlic and aji amarillo paste to the saucepan; stir and let them cook until the onions are soft and translucent. Pour the cilantro mixture and turn the heat to medium. Stir constantly until the water evaporates. Add one tablespoon of oil, if necessary, to fry the herbs. The cilantro and spinach are going to get a dark green color. Pour 6 cups of water and simmer over medium-low heat for 2 hours with the lid on. Check constantly and add water if necessary. 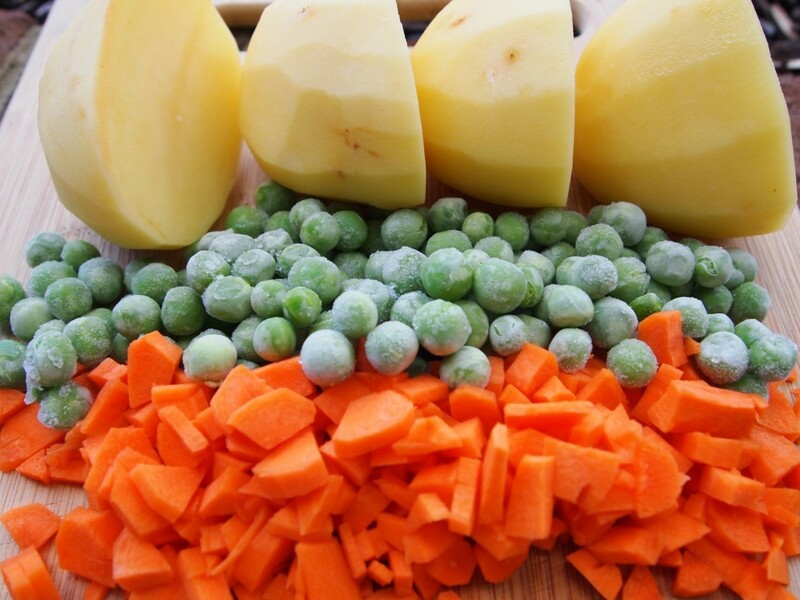 When the meat is fork tender add the potatoes, green peas, carrots, salt and pepper to taste; cook uncovered for 15 minutes or until the vegetables are tender. The stew is ready when the veggies are cooked and the juice is reduced. OMG this looks so yummy!! I am going to try and make this at home over the weekend! I made this last week and served it to my Limeno dad and as he would eat it, he kept on saying mmmm! mmmm! mmmm! My Trujillana mother says now i can open up a restaurant. It was a hit! I love the taste of seco de carne, but isn’t this a bit contradictory? You have already cooked the beef, I don’t understand how is it to be fork tender when it is already cooked. You fried it in the beginning. Hi John! Seco is a stew, first you need to sear the beef and then you simmer it over very low heat with herbs and spices until very tender. If you follow the instructions carefully you will be delighted with the final result. Great recipe! We added a bit of cumin while browning the beef, and substituted jalepenos since we could not find aji amarillo. It was muy delicioso! That’s wonderful! Thanks for sharing your variation with us, and glad you enjoyed it! My boyfriend grew up in Lima. He has tried to make seco here before, and while I thought it was *fine*, it wasn’t anything mind-blowing. When we were in Peru a couple of weeks ago visiting his family, his dad made a vinegary seco de carne (he thought a large quantity of vinegar could be substituted for wine) in which we found not one but TWO fingernails! Thanks for helping me to appreciate Peruvian cuisine, and for making an expat Peruvian guy super-happy this evening. I’ll definitely be coming back to your site again and again! Hi Lindsey, I´m so happy you liked this recipe. Seco should be a tasty stew, with meltingly tender meat, and full of flavor. Hi! Anyway to modify this recipe to make in the crock pot? I am native Peruvian and my mom has always taught me to make it on the pressure cooker. Any advice for crock pot Seco? Gracias!! Hi Natalia. When making this recipe in the crock pot, try to fill it two thirds full. For the first hour cook at HIGH and then turn to LOW. Remember that Seco is a stew and it´s perfect to cook it for several hours at a very low heat. The beef will be meltingly tender and very moist, while the sauce will have the time to reduce and will be very flavorful. I would add potatoes during the last hour, or cook them separately and add them as a side along with the rice. Let us know how you like it. Thank you for posting this! My mother use to make me seco all the time growing up, but it seems like whenever I order it at restaurants in and around New York, they change it just slightly and it’s never as good. Just made this recipe and it’s spot on! I make mine with beef shank, since that’s how I grew up eating it, but will use cabrito next time. Cabrito, Chiclayo style. I´m glad you liked our recipe. I love seco and its many variations. Seco de carne is my fave with frijoles batidos. Chicken and fish are close on my list. Thanks for visiting! I am trying this recipe tomorrow for a dinner with my peruvian sister, her chilean husband, I am chilean and my husband is peruvian, confused? lol. I am sure it will be delicious and unexpected for them. It will bring us beautiful memories of Peru. Thanks. Gracias Antonella! How did it turn out, Marina? This recipe has been tried and tested by many people, and everyone loves it. Thanks for your nice message, Marina. I will send your message to Antonella. Hi Antonela, I forgot that I wrote that commnet, it turned out wonderful, so good that I have them this Saturday for dinner and I will be making Seco again. We enjoy it very much and bring us memories of our childhood in Peru. Thank you for a beautiful recipe. This a great recipe, one variation I use is to pour some beer before vegetables to enhance the flavor. Great addition, Victor! Thanks for visiting. Thanks for sharing this! I have made this three times now! LOVE IT! A Peruvian friend told me to add a tsp. of ají panca to the cilantro mix, too. I couldn’t tell much of a difference in flavor. Thank you! 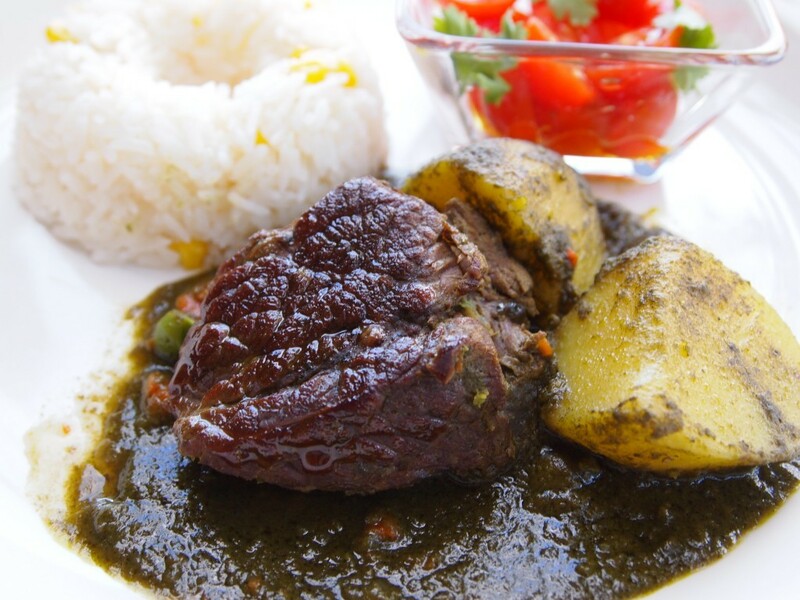 Seco de carne is one of the most popular dishes on the blog. I love it! I never knew this down had spinach in it. I’m a bit skeptical as to how much the flavor would change. You can use stew meat. It´s perfect for this. Why Spinach ? I have been looking for the peruian seco recipe and only yours have spinach . Cilantro can be too strong for many people, this is why we add a few leaves to our dishes, and also spinach gives a beautiful color to the sauce. Que viva Perú, Karlito! I´m going to try parsley instead of spinach… yummy! First of all! I want to say thank you so much to cheer your recipe. I am married to a Peruvian guy for 18 year now and I never found a people so self fish with cheering recipes like Peruvian people. I am making this tonight and hope that my husband will love it as much as he loves his mothers food. Hi Antoinette! Sometimes I like to add beer to some recipes, like Arroz con Pollo, it gives the dish a depth of flavor that I love. And yes, you can use yuca instead or in addition to the potatoes. Thanks for visiting! I commend on your spreading the word about our great Peruvian dishes. I may comment that seco never has spinach….sorry for my categoric “never”. Cumin very littlelike a pinch and beer, yes just a bit as well and these last two ingredients are optional. I have my seco on the stove as I type and I checked yr site before finalizing it. Thanks for mentioning the potatoes and carrots. Some other people don’t and I feel that potatoes soaked in the meat juices and sauces is so good on this dish. All the best for you. 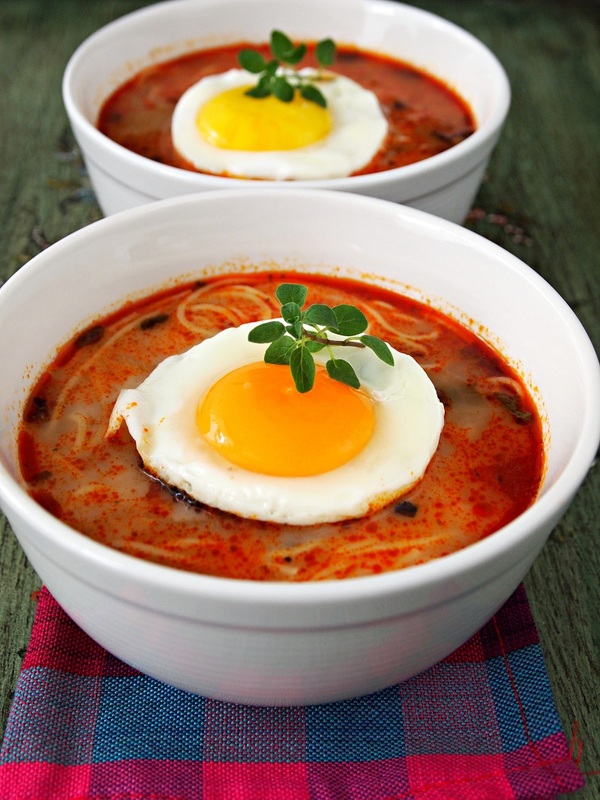 One of my favorite meals… Can’t wait to wow my kids with this recipe. Can’t wait to hear about it Arturo! 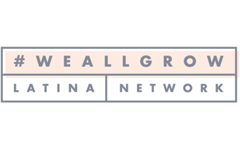 I am Peruvian and I am extremely happy to have found this site. I just moved to California with my (American) boyfriend, his family has never tried any Peruvian food other than Lomo Saltado and Alfajores I made for them last week. So I am very veeeeeery excited to start trying out your recipes and make them fall in love with our amazing food. Glad to hear that, Katherine. We hope your boyfriend´s family will love our Peruvian recipes. Thanks for visiting. I’d like to share this recipe that has giving a lot of pleasure to both, all american friends that taste it first time and myself. This recipe is from Don Cucho, I pulled it from the internet back when the peruvian cuisine was not as popular as it is now. He has a restaurant in Lurin, south of Lima and it’s named after him. For more than 4 persons just double the recipe’s proportions. Peel off all the fat from meat and cut meat in 4 even pieces. 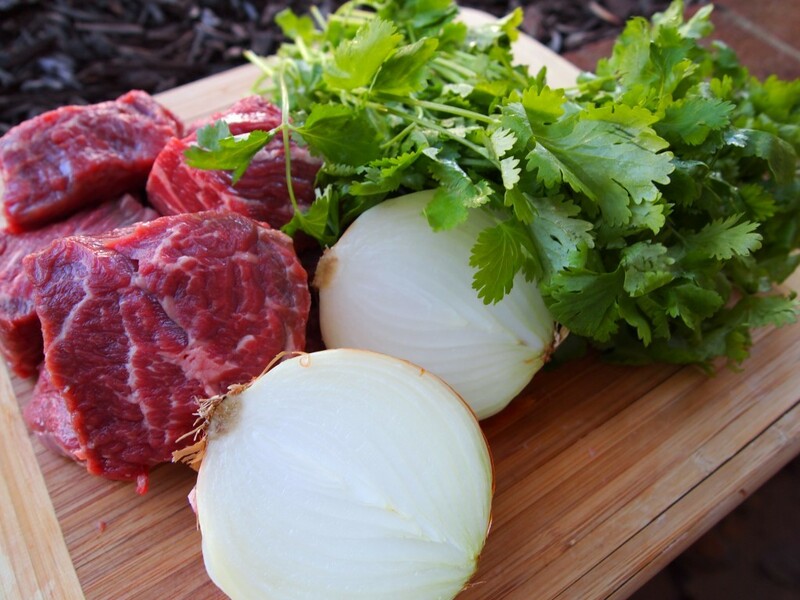 Place in a bowl the meat and add beer or ‘chicha’, then spread the marinade ingredients on the cut meat. [mix all marinade ingredients to form a paste, add salt to each piece AND DO NOT ADD ANYMORE SALT until the end when the meat is falling apart. Then spread the paste onto each piece of meat, place them on a bowl and add the beer or chicha]. Place the bowl in the fridge overnight. In a large cooking pot with a tight lid, add 3-4 tbls of oil, add crushed garlic to a medium heat, when garlic begins to smell add the aji de panca, and stir with garlic. Let it saute for 2-3 minutes then add the cilantro paste. Since it is all wet let it saute a bit longer and increase the heat and stir the mix until the juice evaporates then add the minced onions. Mix everything, and close the lid. Keep checking the mix until the onions reduce in volume. Add the marinade to the cooking mix. Cook for about 2 – 3 hours, stiring every 15 to 20 minutes with lid closed medium heat. As I said before, do not add any salt until you see the meat is coming apart. So, no need to taste at all now. When the moment comes and meat breaks apart easily with the wooden spoon, add the salt little by little. As you add more salt the flavor will come up. Have some one else taste it for you. Remember, you can always add more salt. When it is ready, let it rest for about 15 minutes and serve it with rice or lima beans. Thanks for sharing this, Roberto. 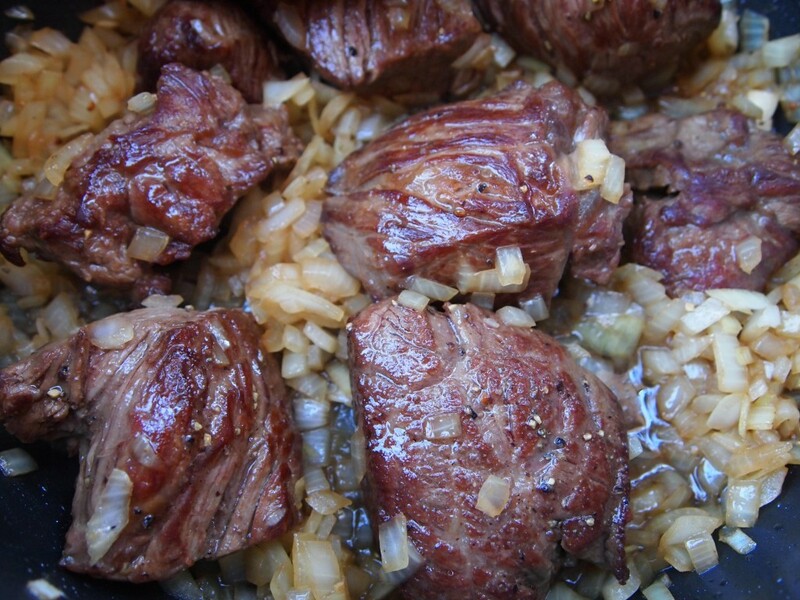 We stand by our seco de carne recipe (in fact, it is the most popular in this blog! ), but are always open to try variations. Don Cucho is a great cook! This looks yummy! My recipe is similar but I usually marinate the beef in chicha de jora for a couple hours and then add a little bit of that to the stewing sauce too. I love the addition of spinach — great idea! As my parents grew old (we are Peruvians) they could not tolerate cilantro as much as when they were younger. To our amazement, one day my mother replaced 2/3 of the original amount of cilantro she used to add before with spinach and the difference in flavor went almost unnoticed. That strong is cilantro’s flavor. I believe she said it had been a suggestion from her doctor who also happened to be a cilantro lover. To this date, I still prefer the spinach replacement as I find it easier to digest. Thanks for your recipe, I will happily try it as soon as I get back home. Thanks, Jessica. We mix spinach with the cilantro because we hear many complaints about how strong cilantro is. We are used to it, but totally understand this issue. And you are right, the spinach flavor is mild and difficult to notice. We think it´s a good idea to make this mixture. Thanks for visiting! I’d like to make this in the pressure cooker, should I make any changes on the measurements or keep it the same? I’ll cook and add the veggies afterwards. Thank you so much!! You should use less liquid. The meat will turn very tender. The pressure cooker is a great help in the kitchen. I’m so going to try this recipe. I’m a white girl wanting to make one Peruvian happy by learning how to prepare Peruvian food. We live far apart and haven’t got to spend time together. I’m pretty sure learning some recipes would help steal hear heart. I love to cook and this dish looks awesome!!! I tried this tonight and it came out great! However, I think I just need to tweak it a bit and practice. When you say let the water evaporate are you wanting the sauce to be thick? Also, my problem was the salt. I wasn’t sure when to add it (before the cilantro/spinach sauce or after) and I forgot about it until after I had it cooking already. I added some salt but the meat itself didn’t take much of the flavor. Any suggestions? Thanks! Oh! And one more question.. so it seems that you use a lot of aji Amarillo paste in your recipes. At least from the many I’ve tried. One thing I’ve noticed after making this mistake several times is that it is quite strong (the aji). Today after I put in the one table spoon I realized , “WOOPs! Next time cut it in half!”. Is it meant to be spicy or just to add a little flavor? I think I’m learning to go easy on the aji Amarillo as I keep finding the paste is strong. Thanks! We have been giving this advice for a while now: try the aji amarillo paste before using it. Sometimes it´s mild but other times is extremely hot, maybe because the chilies are processed with the seeds and veins. We´ve had this problem several times, even the same brand is different. The idea is to have the fragrance and the flavor of aji amarillo in the dish but we don´t like it to be to spicy. If you don´t like it feel free to skip it or just add 1/2 a teaspoon or so. Add the salt after the cilantro/spinach mixture. Taste again at the end of cooking and add more salt if you think it´s necessary. Have you ever tried this recipe in a slow cooker? I know that things don’t always taste the same. Just wondering if you would change anything. I haven’t tried it in a slow cooker. Maybe I should. Hi, would it be possible to use this in a pressure cooker (like instant pot) and if so, are there any changes in the recipe like water amount? Thanks! Use two cups water and cook for about 45 minutes.The beef will be fork tender. Thank you!! My family loved it!! Will definitely make this again! Your ingredients list doesnt include potatoes, How are they cut? Do I have to noil them before I add them in the end? Hi Jackie! Yes, the recipe list says 2 potatoes cut in four parts. Read the recipe for the instructions. Thanks for visiting. Incidentally, I also learned that it’s a great idea to cut a beef roast into chunks for stewing instead of using pre-cut “stew beef.” This method kept the beef chunks noticeably moist, especially compared to stew beef which can cook up tender but dry after prolonged simmering. Thanks for a good cooking tip, and a great recipe! Thanks for the tip and for visiting, Shane! This recipe looks terrific and I want to make it this weekend. One question, I’d like to cook it the day before we eat it to save some time. Do you recommend that or will the flavors not stay with the dish that way? If you make it the day before the seco will be even better. Have fun and enjoy! It is very similar to gorme sabzi a Persian dish. I will try it.